There are some days though, where The C word, becomes a huge issue for other people, and can even spur on decisions that make or break relationships. 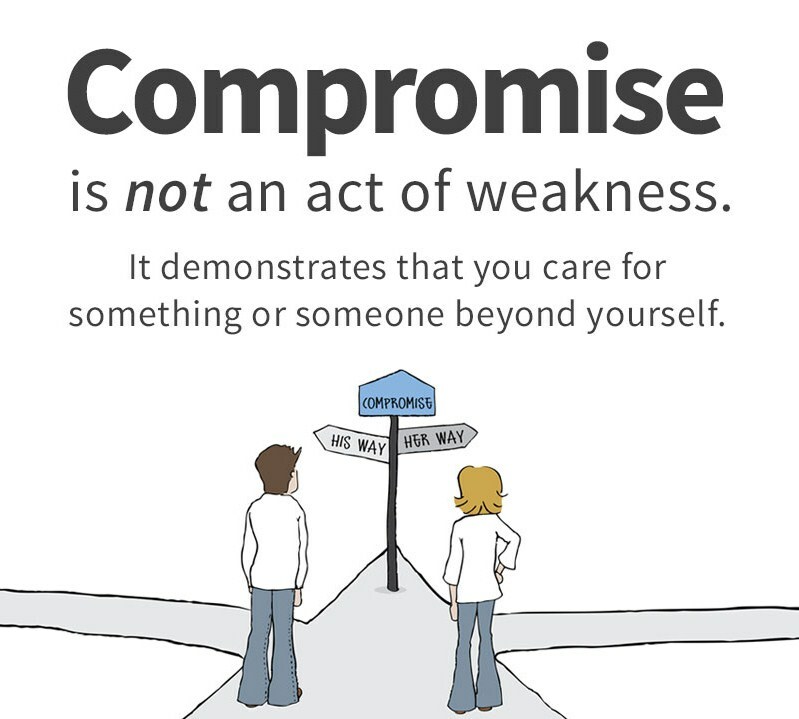 Compromise is a powerful tool that everyone should at some point master. I Thank God for my emotional strength and the support I get from other people, even the fresh faces from 9 months or 12 months.. You’re practically fam too. Explicitly outline the middle ground, What you want from the compromise vs What they want, often this won’t always be possible so one or both sides need to scale the weights of their idea, what you think are the pros and cons of your suggestion and weigh it out with the other person’s. Rule 3, repeat rule 1-2 as much as necessary until either you, or the other person commits to the ideas put forward and fit the criteria for middle ground. Weigh out your options and commit both ideas together! many a time I have made a compromise for the worst, but not without it’s perks through traded off experience. Middle Ground is finding that common identity with the other person and other people where you can both / all agree on a set series of criteria that have outweighed pros to cons. DO NOT offer an unreasonable suggestion, find an alternative solution to the idea provided, a weekend break instead of a holiday? maybe just sleep over instead of a weekend away? DO NOT contradict the other’s suggestion, this is often known as “reverse bargaining” and often leads to the same response and more, the reason behind this may be because the other thinks you possess lots already and don’t see the need for anything more than necessary. I found this with a quick Google Search and contemplated on how real and accurate it was on how much of it people apply it compared to how much I apply it. If I continually disagreed on something, would a compromise ever be found? Answer: No, Because you have a set notion of what you want vs. the set notions I have, with the constant negation of your ideas there is no fundamental concept of middle ground, just by offering a solution, I could provide you with a concept towards middle ground, but until a point where I would offer the solution, a Compromise would essentially be impossible. Isn’t that answer an amazing little fact?